The ExeDesk is a skinable (theme enabled) virtual desktop manager that replaces standard Windows desktop. 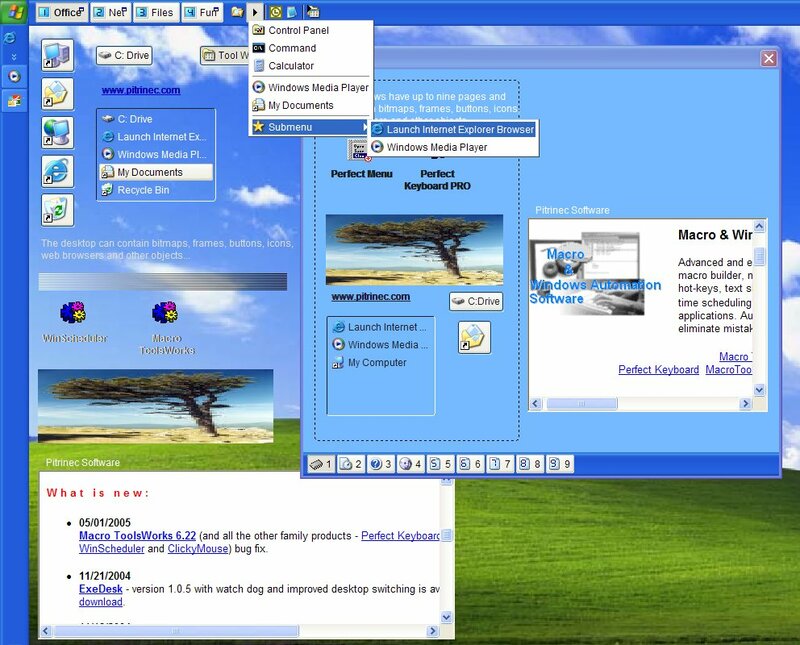 The program features multiple object types (icons, buttons, frames, text,...), menus, tool windows and more. Fully customizable and easy to use. ...... ..), menus, tool windows and more. The program is fully customizable: User can select different color and wallpaper for each desktop, assign hotkeys to desktops, select from many types of objects to represent particular application (or file or WWW) shortcut. The program supports drag & drop and is easy to use. Professional edition only: Theme creation/editing, desktop password protection, screen resolution per desktop , better color control. Qweas is providing links to ExeDesk, Standard Edition 2.0.3 as a courtesy, and makes no representations regarding ExeDesk, Standard Edition or any other applications or any information related thereto. Any questions, complaints or claims regarding this application ExeDesk, Standard Edition 2.0.3 must be directed to the appropriate software vendor. You may click the publisher link of ExeDesk, Standard Edition on the top of this page to get more details about the vendor.